Those looking for symbolism about which way Wisconsin is headed might want to consider the current hubbub over a possible Foxconn plant in Wisconsin. This is a company that is infamous for its poverty-level wages and horrible working conditions, with riots, worker suicides and violence at the Foxconn plant in China. Yes, the company is likely to offer better pay and working conditions in America, but this is a contract manufacturer that specializes in cutting labor costs. How many of its jobs will pay a family-supporting wage? The hope is that Foxconn could bring 10,000 jobs to the state, but other sources suggest the company could build plants in several states (five are under consideration) that each employ several thousand people. Yet Wisconsin’s political leaders are scrambling to provide a package of incentives that could include “property tax abatements, income tax abatements, job creation tax incentives, infrastructure improvements, etc.” as the Milwaukee Business Journal reported. It’s all part of a continuing strategy by Gov. Scott Walker and Republican legislators to blindly throw money at companies in hopes it will lead to more jobs. The emphasis, moreover, has generally been on incentives for the manufacturing sector, which has been in decline in Wisconsin and across American for decades. And the impact on jobs? In the two years prior to adding the tax credit, total jobs in manufacturing rose 2.1 percent. In the two years after the credit, manufacturing jobs rose by exactly the same rate, 2.1 percent. Or take the Wisconsin Economic Development Corporation, which has been mired in endless problems since its creation in 2011. Once again the strategy has amounted to throwing money at companies, and once again manufacturing companies have gotten much of the money. And the results? Walker famously promised to add 250,000 new jobs in Wisconsin in his first four years and still hasn’t hit the target after nearly six years. His fixation on manufacturing jobs might help explain this. As a recent report by the Congressional Research Service (CRS) found, manufacturing employment continues to plummet in American, dropping from 17.1 such jobs million in 2000 to 12.4 million today. For all Donald Trump’s talk about trade deals, a study by the Center for Business and Economic Research at Ball State University found that of the 5.6 million manufacturing jobs lost by the U.S. between 2000 and 2010, just 13 percent were due to trade. The rest were eliminated due to automation, robots or other efficiencies. Since manufacturing hit bottom in June 2009, there has been a 21 percent increase in manufacturing output but only a 6 percent increase in manufacturing employment, the CRS study noted. It pointed to the steel industry, where its 84,000 workers in 2016 produced 3 percent more steel than nearly 400,000 workers did in 1980. And increasingly, the employment growth in manufacturing is for those with a college degree or better. Between 2000 and 2016, the number of manufacturing workers with graduate degrees increased by 35 percent while those with high school degree dropped by 31 percent, the CRS study found. “Even strong growth in manufacturing output could well have only modest impact on job creation and is unlikely to increase demand for workers with lower levels of education,” the study warned. Foxconn is a poster boy for the manufacturers of today, non-union shops that specialize in driving down labor costs. And Walker and Republican legislators have assured that all private companies can now freeze out unions by passing the Right to Work law, which bars collective bargaining contracts from including a clause requiring company paychecks to collect union fees. States with such laws have driven down average wages and benefits, as Data Wonk columnist Bruce Thompson has concluded. Wisconsin has ranked behind other states in employment growth in every year Walker has served as governor, and anemic manufacturing growth has been part of the problem. The state’s manufacturers “actually lost 3,784 jobs from December 2015 to December 2016, a drop of 0.8%… which was far steeper than the national average,” as the Milwaukee Journal Sentinel reported. And this decline in jobs came even though these companies now pay almost nothing in state corporate taxes. Even as Walker and Republicans continue their efforts to bring back a golden era of manufacturing that will never return, they are seem hostile to the new economy. There is no more significant job engine than UW-Madison and its mother lode of research dollars and patents, which is spinning off bio-tech companies and other cutting-edge businesses. But Walker and the Legislature have cut state funding for the UW System, while their main interest in the biotech industry has involved efforts to end stem cell research. Walker’s approach to energy has been just as backward looking: he has embraced coal and thrown up roadblocks to wind and solar power. Wisconsin spends more than $12 billion annually to import coal and gas, importing pollution to this state and exporting potential jobs to coal and gas producers elsewhere while failing to grow alternative energy jobs here. Walker and the Republicans really don’t have a vision for the future, just an ever more expensive portal to the past. Bruce, if I’m reading this correctly, you seem to be of the position that any and all incentives to lure out of state (or country) companies to create jobs in Wisconsin are essentially an automatic bad thing if they happen to be manufacturing jobs. Am I off base with that assumption? I would like to hear about alternatives. I’ve seen a few negative article and they all seem to reference low pay, but I would expect that low pay is better than no pay. Just the work experience alone is of more value to some people who are out of work at the moment. I know Taiwan theoretically isn’t China, but it’s pretty darn close. Why are (supposedly) freedom loving, flag waving Republicans so giddy with the prospect of luring Foxconn here with expensive bribes? We are empowering an enemy of democracy with these types of deals. (As a sidenote Nobel prize winning Chinese political prisoner Liu Xiaobo died in prison today). A big reason why manufacturing is on the wane in this country isn’t because we don’t need it. It’s because of the $750B annual US trade deficit (in goods). This deficit benefits multinationals and hurts workers and small business. (And no, I don’t think Scott Walker, the rest of the GOP, corporate Democrats, placated consumers, or even Bruce Murphy gives a rats patootie about it). Yes, AG, I think you are reading into it a bit much…The use of an absolute such as ‘any and all’ in your “question” reveals a bias. Bruce was pretty clear with actual examples: 1) Huge tax cut, no detectable increase in employment and 2) WEDC money everywhere, really small percentage of them tracking the purported goal of increasing and retaining jobs. I think that sends the message that we should think carefully if that’s how we want our limited attraction dollars spent — doesn’t mean we can’t lure a manufacturer, but that more effort should go into doing so that the average person benefits. Hey, there’s still some hope we won’t get all those jobs, right? Vinehout can tout her economic development plan of taxing trains as they roll through Wisconsin. I don’t necessarily mind Wisconsin getting manufacturing jobs, but the way that the Walker Admin has done it, with tax cuts and WEDC giveaways, is not the way to do it. And making the state right-to-work (for less) hasn’t helped attract people into learning skills and taking jobs in this low-wage state. Be very skeptical of all this. It seems like a scam designed to trick voters into thinking “see, jobs are really coming” and ignoring the failed results. It’s the same trick Walker has pulled at numerous donors/employers, showing up for a “jobs announcement”, but being strangely silent when the jobs don’t happen. Or worse, get outsourced. Foxconn is more than happy to get rewarded by a desperate Scott Walker. How many millions of dollars would this going to cost Wisconsin taxpayers, in a delayed budget that has no extra money to give away,? If we don’t know the cost of this auction, that’s not a good sign. We deserve to know what’s going on before they try to ram through some kind of giveaway package through the Legislature. Bruce ,with out Walker and the GOP we would have no attempt to lure a company like Fox Com to Wisconsin. We potentially, would not have the state funds to keep the Bucks here. We would be Illinois. We can not be controlled by the government unions. Yes only the GOP ever lures new business to a state. Which explains why all the best state economies are blue states. That is Troll logic. and yet more and more business move to Illinois everyday…..fox comm coming to wisconsin…L.O.L at that….not going to happen!! “HOW can America’s leaders foster broad prosperity? For most Republicans — including Donald J. Trump — the main answer is to “cut and extract”: Cut taxes and business regulations, including pesky restrictions on the extraction of natural resources, and the economy will boom. Mr. Trump and House Speaker Paul Ryan are united by the conviction that cutting taxes — especially on corporations and the wealthy — is what drives growth. Dragonkat, your state just raised state income taxes in a hope of not becoming rated as JUNK . Illinois is a disaster and if you own a business in Illinois you have to be thinking about exit. There are 48 other states Troll, in case you forgot. You can’t just compare Wisconsin to one other state. Plus it’s not like we have much to brag about right now. What’s the slogan? “Wisconsin, Cause Hey We Are Just Slightly Better Than Illinois!” Great job Walker! Bruce, you’ve lived in WI long enough to know there isn’t enough sun for solar to be effective and wind is only an option off-shore and enviros won’t stand for that. And even Doyle converted a couple plants to burning biomass. Walker should buy a couple Bloom Boxes. But he hasn’t had an original idea since the 2002 campaign promises refrigerator magnet. Vince you seem to always be bringing up the economy of Oklahoma. Illinois is relevant since Dragonkat claims to live there and that he is bashing the economy of Wisconsin and yes, there are many territories a business can set up shop in. Many appear to be residing in Kenosha and Racine Counties. Rich, the reason I read it that way is because Bruce seems to be making assumptions that the same will happen with any incentives for Foxconn. As far as I know, few people know what the incentives will be, so it’s a bit early to judge. And Bruce never couched his statement saying incentives make sense depending on certain outcomes or key performance indicators. Dragonkat, can you start putting “troll” behind your name as well? Dragonkat, by the way, where do you get your news? If it weren’t for the Private sector growing their businesses in Chicago, despite all the challenges, Illinois would be doomed. And as much as you would like to think it, it’s not your governors fault your pension issues are so out of control. Thank the unions for that. Wisconsin’s solar potential is comparable to Germany’s, which has become one of the leaders in solar energy. Even with the income tax increase, isn’t the rate in Illinois lower than in Wisconsin? And the comparison is usually to the economy of Kansas, not Oklahoma. The reason is that when the governor of Kansas successfully pushed for a whole host of tax cuts and other conservative reforms, he said Kansas would be a laboratory to demonstrate their effectiveness. Vincent, I’ve seen similar reports. While I think so far it’s be a “well it depends” kind of thing… the other way I’ve looked at it is, if some states do nothing and others use incentives… even if it’s a net zero gain for the country, you’ll still have an imbalance state to state. Do you want to be one of the states on the losing end? It tends to kind of force your hand. Indiana’s right wing nightmare has been responsible for luring bottom feeder industries to the state and offering 10 dollar an hour jobs; it’s not helping anything grow here. In the past decade, cost of living has risen 60%, salaries 9%. They keep crowing about how they are going to be the Mid-Wests number one tech area, while the latest USA Today tech map shows almost zero tech in Indiana, and zero growth, while Madison and Milwaukee are considered “burgeoning” tech areas! Indy is even crowing about attracting the first U.S. location for a bottom-feeding tech company from India to build their new facility! Don’t let Walker execute the Republican plan of bringing in bottom-feeder jobs to keep people slave labor and off-kilter! He’ll ruin Wisconsin! According to a recent Brookings Institute study, Indianapolis is something like 47th on growth, while it’s 79th in how it shares growth at all economic levels, while Milwaukee is 53th in growth, but 26th in how it shares. Don’t let the republicans disenfranchise the middle class worker in your state! So if that’s the case what is the best approach here? Be smart about the amount and type of incentives? Make sure you don’t do more harm than good while crafting the incentives based on what other states are offering? I’m not sure I trust our elected officials to do that because they are blinded by “10,000 JOBS” even if that number is more fantasy than reality (not to mention what type of jobs and their pay, etc.). I’d generally agree with your assessment. While I’d ideally like to see elimination of corporate taxes (which takes that out of the equation) I hold a belief that if it’s a specific incentive for specific company then you should have performance metrics that must be met. If it’s a general policy change, such as eliminating income tax on manufacturers that aims to make it easier to do business in a field or in general, then you probably wouldn’t apply such requirements. So for Foxconn, I’d hope they set some requirements if they’re getting direct incentives. But as of right now, we really don’t know anything of what is being proposed by either Foxconn or our government entities. That makes sense as that Wash Post story above says that the metrics are not tracked enough after these deals are struck and the business is up and running. The Indiana state government gives incentives to wealthy companies to build 1800.00 a month apartments for wealthy workers at Eli Lilly. No incentives to build working class, safe apartments. There should be zero incentives for wealthy companies to build anything, unless it’s going to impact the average worker! Nothing wrong with tax incentives to bring business into the state as long as there is an ROI. If the state wants to use tax credits to incentivize businesses to create jobs in Milwaukee, I am all for it. I don’t feel slighted in the least that an enterprise which brings new and non-organic employment into the state gets a tax break for doing so. Need those jobs. I am reminded of John Gurda’s quip that “Make America Great Again” sounds a lot like “Make it 1958 Again.” And I wonder about the Walker defenders whose basic line is that Illinois is doing worse. Have they heard of our neighbor to the west, Minnesota? Amen to Bill Kurtz for reminding us of a clever remark by John Gurda: “Make it 1958 again.” Seriously speaking, Walker and his fellow reactionaries appear to wish that it were 1932 again. They look to be hell-bent on repealing everything progressive that was done with the help of our federal government in this country by every progressive from F.D.R through Obama. The GOLDEN AGE the reactionaries who call themselves conservatives yearn for is the era of THE ROBBER BARONS. Reactionary media calls THE ROBBER BARONS the CAPTAINS OF INDUSTRY. 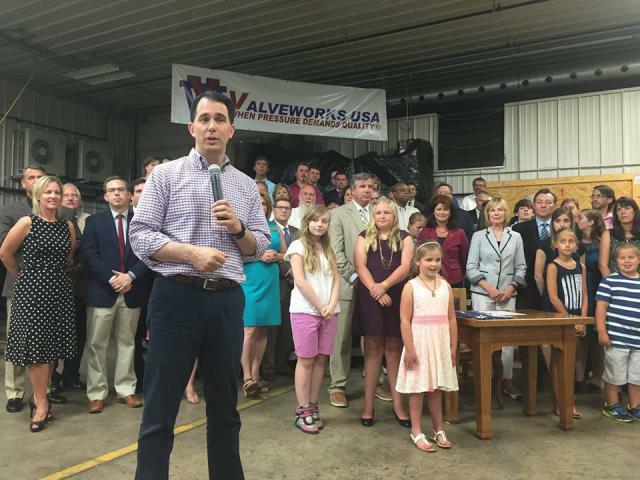 Walker’s wistful backward glance towards olden days manufacturing could rob the majority of WI citizens in order to further enrich a few, select barons – most of whom do not live in this state. Walker’s effectively meaning BACKWARDS every time he says FORWARD will perpetually impoverish the citizens of this state for the benefit of a few rich pals as long as he holds office here. Bill- The comparison I frequently make is “would you be celebrating if the Packers were 5-11 because they finished ahead of the 3-13 Bears?” That’s how WISGOP and Walker defenders apparently think. They don’t care that we keep lagging behind and deflect from their failures. And giving away millions (or tens of millions?) to a corporation isn’t going to turn that declining situation around. In fact, given the huge budget deficits and service cuts that we have already had, this could well make things worse, not better, if it’s not done right. This might be a good place to talk about the insanity of the republican party deifying corporations and business owners. Corporate welfare is a problem. If you cannot offer at least 15 dollar an hour jobs, with health care, minimum, then why should Wisconsin use tax money to help you out? Any moron can build a competitive company relying on substandard and unlivable pay and no health benefits. We don’t want those companies. Third generation people who have driven their grand-parents companies into the ground through years of not staying current with technology or having substandard business practices, and pay poorly so that they can maintain their life-style, are not something that we need to prop up, either. The standard for getting a tax incentive should be brutal! At the state level, the only reasonable strategy for economic development is in promoting industries (like dairy,tourism, etc), not specific corporations and individuals. The balance sheet of one individual corporation is not the responsibility of the governor…. but it certainly can make campaign donations a sure-thing investment. Recruiting and retaining companies is the role of local municipalities – where the benefits of job creation are direct. Some cause for concern here? “In return for building an industrial campus that could employ as many as 10,000 people in Wisconsin, Foxconn Technology Group almost surely will expect subsidies, tax breaks, job retraining promises, infrastructure improvements and other government incentives. If we don’t want to use tax incentives, I guess we can attract businesses with pay-to-play schemes. Oh wait that’s illegal. That’s more than just tax incentives being offered JPKMKE. Are you saying economists are wrong when they declare that states can go too far in strenuous efforts to attract new companies? It’s not possible for states to offer too much? Vincent you’ll notice my earlier comment…nothing wrong with tax incentives for this purpose as long as there is an ROI. I don’t think there is an economist who would disagree with this. That doesn’t really answer my question. Again, I am not just talking about tax incentives. That doesn’t necessarily sound good. Vincent, I’m not commenting on the quality of a target company in this case. I don’t know anything about Foxconn. The criticisms may very well be real or they may be sour grapes from a losing party in a transaction. I just don’t have that information. I do agree that a high volume of very low wage jobs would be a concern. However, the employment math for the city of Milwaukee shows that a very large import of minimum wage jobs may not be possible to staff. The same thing happened here in Pueblo, CO. The city had a budget to bring in more jobs. Pueblo is (or I should say was) a steel town but the factory employs only a fraction of the number of manufacturing jobs that it used to. Pueblo gave incentives to a company from Russia to locate here but there are no manufacturing jobs, the manufacturing jobs at this company are all automated. At least there are some solar jobs here. I have searched for the story on the Russian company in Pulp archives but have been unable to bring that result up. Here’s a more recent story.